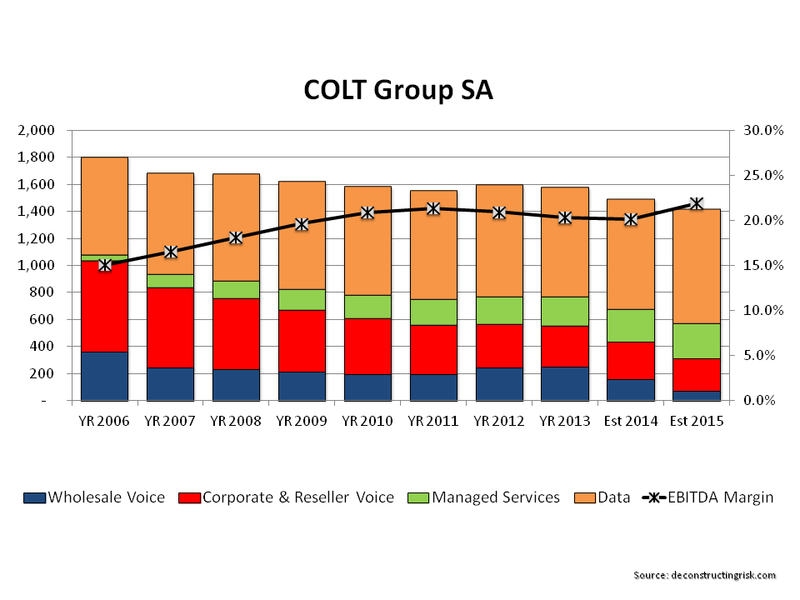 COLT announced plans this week to cut €175 million of low margin voice wholesale business and take a €30 million restructuring charge in an attempt to address declining margins and halt operating cash burn, issues which I highlighted in a previous post. The stock took a hit and is down about 10% on the month. Press reports, like this FT article and this Guardian article, speculate that majority shareholder Fidelity is losing patience and the business is effectively for sale. Robert Powell at Telecom Ramblings is also speculating on potential buyers. The graph below shows my rough estimates of the revenue and EBITDA margin (excluding restructuring charges) for 2014 and 2015 based upon COLT’s guidance (2015 is purely based upon my guestimates). The execution risk in the restructuring based upon the firm’s recent history doesn’t match up against any potential M&A upside in my opinion. This one is best to watch from the side-line. It should be interesting. This entry was posted in Telecom and tagged alternative telecom valuation, COLT share price, COLT Telecom, colt telecom valuation, EBITDA margin, European telecom sector, EV EBITDA multiple, EV/EBITDA multiple telecom, Fidelity, LVLT, operating cash burn, pan European telecoms, potential M&A, telecom consolidation, telecom EBITDA multiples, Telecom Ramblings, vodafone, voice wholesale business. Bookmark the permalink.